When people purchase a fine watch or piece of jewelry, they probably never expected that one day they would want, or need, to sell it. Moreover, when the item was purchased, a retail appraisal was probably included with the purchase. Most Diamond, Diamond Jewelry and Watch Appraisals are written for your protection in the event of theft, loss, or damage and establish a retail value for your insurance company to cover any losses that you may incur. Although an appraisal is a very important document that helps protect you from loss, it can be misleading when determining the actual cash value of your item. What many people don’t realize is that your diamond, jewelry item, or watch can never be sold for the appraised amount. As proof, try asking the appraiser to buy the item from you for the amount he just assigned to it (most likely more than you paid for it). When the appraiser refuses, you will now understand the difference between Replacement Value, which is the appraisal amount) and Cash Value. 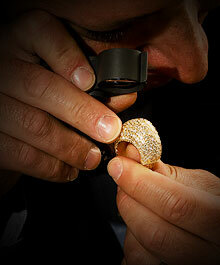 Now that we know about appraisals, what does this mean in terms of your jewelry? Unfortunately, it means that you will not get the appraised price for your jewelry. Moreover, you will not be able to borrow the amount of the appraised price. In general, the true value of your jewelry is usually between 10% and 50% of the appraised value. Appraisals are written to account for the Retailers Markup (as much as 3 times cost), manufacturing/labor costs, and the fact that many insurance companies only pay 60-80% of the appraised value. In addition, many retail appraisals are written to account for the potential inflation that may occur over several years in the gold, diamond, and jewelry markets. Typically, diamonds are in the same condition as when they were purchased from the retail store. Jewelry and watches, on the other hand, are subject to wear and tear and therefore, the value of the item is typically discounted. Unless a piece of jewelry has significant provenance, or is a signed piece such as “Tiffany & Co.,” we must calculate the value of jewelry as the sum of its parts, for example, the weight of the gold plus the value of the diamond(s). When you send Lombard Mutual a fine watch, many factors influence the price. A watch that includes the original box and all paper documents such as owner’s manual, title certificate, warranty card, etc. is typically worth more than the watch alone. The overall condition of the watch is relatively important as well: is it working? Are there any missing parts? Finally, how much we would have to invest to return the watch to a condition in which it could be sold is reflected in the price we can pay for the watch. Since there are no government guidelines, state laws, or other rules for appraising jewelry, it is difficult to provide true cash value of your item based on a retail appraisal. Lombard Mutual will pay you the actual value of your diamond, jewelry or watch based on our own strict laboratory evaluation. We are happy to provide you with a value range based on the information you submit and provide us during a telephone consultation.